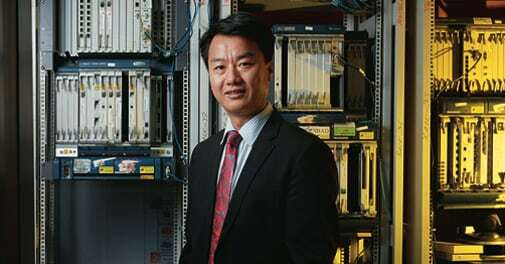 Chinese telecom giant Huawei's Bangalore research centre is proving a crucial resource in its global telecom battle. Ren Zengfie, CEO of Huawei Technologies, believes in taking decisions after careful deliberation. It was two-and-a-half years after he first thought of doing so that finally, in May this year, he gave an interview to the media - a group of journalists in New Zealand. It was his first - and so far only - such interaction since he launched Huawei 26 years back in what was then a sleepy fisherman's town in China called Shenzhen. (Today, it is a globally renowned manufacturing hub.) In comparison, Zengfie took barely a year to decide to set up Huawei's first research and development (R&D) centre outside China in Bangalore in 1999. That decision has had a pivotal role in shaping Huawei's future. 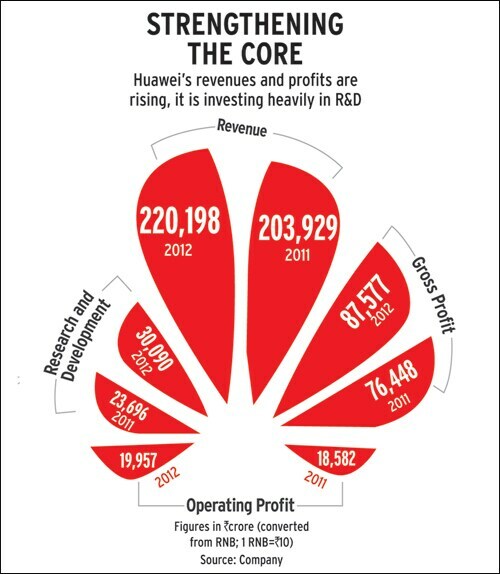 Huawei is now internationally famous for its prowess in making telecom equipment and networks. The Indian market comprises a small fraction of its global revenue. 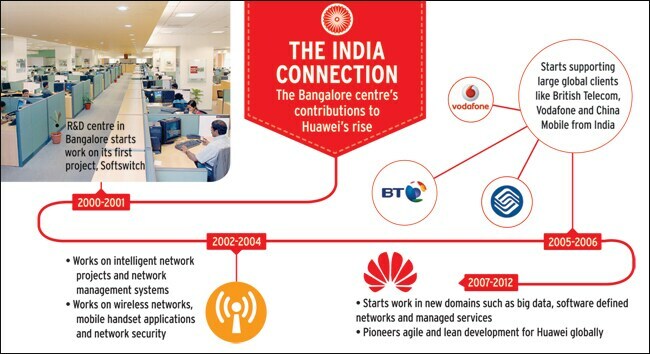 But the Bangalore centre is a different story - it has played a stellar role in Huawei's growth. It is not only the first but also the largest and fastest growing of Huawei's R&D units outside China, employing around 2,700 people and developing products and solutions for the company globally. No surprise, then, that Huawei recently announced an additional $2 billion investment in India, part of which is being used to build a second R&D facility in the country. For years, Huawei was called a price warrior. Its products were cheaper, but hardly original. But all that changed in 2006 when it made the single-RAN (radio access network), a part of which was developed at Bangalore. This helps telecom operators graft technological innovations, such as 3G or a Long Term Evolution (LTE) Service, onto their existing networks. Huawei claims the single-RAN brought down costs for operators by 33 per cent and helped them increase capacity by 25 per cent. Such an innovation would never have been possible without cutting- edge R&D, says Ken Hu, Deputy Chairman and Rotating CEO of Huawei Technologies. "Huawei's innovation is very customer-centric,"says Hu. "It will begin where customers' need starts and end where the customers' need ends." The telecom industry is all about capacity - the more subscribers an operator has, the better for it. India thus became the benchmark for handling a large number of subscribers at low cost, says Wilson Wang, Chief Operating Officer of Huawei Technologies India. It required ramping up capacity of operators so that the systems could support more subscribers. It made an overhaul of the billing and charging system imperative. The Bangalore unit worked closely with Huawei's clients to achieve this. Among its customers was Bharti Airtel, India's largest operator by subscribers and revenue. "The platforms and components delivered by the India centre were later deployed for the majority of leading global operators including Vodafone, T-mobile, China Mobile, KPN (Holland), Deutsche Telekom, and Megafon," says Wang. Even competitors such as Nokia Solutions and Networks (NSN) acknowledge the application and product development carried out at Huawei's R&D centre in India. "It constantly watches its competition, and often develops products better than its competition, and a lot of that is happening in India," says a former NSN employee. Over the last 13 years, the Bangalore R&D centre has worked on next-generation networks such as 3G and 4G, network operating systems, mobile broadband software platforms, service delivery platforms and mobile broadband software. With its engineering prowess, India has become the hub for Java-based software development. In 2000/01, the Bangalore unit started work on ring-back tone solutions. This was first deployed in China Telecom and later taken around the globe. Today, Java is being used in a host of other application solutions which make telecom networks intelligent. "Increasingly, more software is being deployed in network," says Kamlesh Bhatia, Research Director with Gartner. "A lot of future networks will be software-driven, which will require a lot of IT skill sets." Huawei in a very short span of time has outpaced European competitors, such as NSN and Ericsson. It became the world's largest telecom networks company in the last quarter of 2012, closing the year with revenue of Rs 220,198 crore and profit of Rs 87, 577 crore. It made investments worth Rs 30,090 crore in R&D. Huawei signed its first international agreement with Hutchison Telecom (Hong Kong) in 1997. Since then it has signed contracts in more than 150 countries with most of the telecom operators. About 70 per cent of its revenue comes from outside China. Application and product developments, along with building and improving networks, will help Huawei double its revenues by 2017, asserts Hu. About 40 per cent of this will come from new businesses such as smartphone and enterprise business, he maintains. Products such as Voice over LTE, where data will be used to transmit a call, are being developed in India and have already been deployed in Latin America and Germany. Huawei is also making solutions in India which will help companies integrate their telecom and software, further reducing costs for operators. About three years back, Huawei realised that if it had to succeed in Android-based smartphones, it had to differentiate itself from the competition. So it is developing its cloud strategy which will help all wireless access devices to connect and use the Internet in a better way. It has also built what it calls the Emotion UI (user interface). "The UI is intelligent and makes it easier for consumers to customise their phones," says Jerry Huang, Director of Marketing Communications at Huawei Device Co. All Huawei smartphones will have this interface. India's R&D centre has complete ownership of the Android-based smartphone key components such as Social Networking Service, Personal Information Management, messaging and email, Android-operating system applications as well as management solutions for all products of Huawei devices. Just two-and-half years into retailing smartphones, Huawei has already become the third-largest phone company globally. India's importance is growing for Huawei. It has started a Huawei Fan Club in India, the only country outside China where it has done so. It is a campaign that helps to understand the customer better. The inputs later become reference points for product development. "India is very good for emerging markets," says Huang. Hu is not chasing revenues any more. He is keener to take technology development to the next level at Huawei, which is not possible without a skilled team of engineers. That is the reason India is important to the company. "We don't care about passports," says Hu. "We want the best technical staff." In an effort to retain talent in India, Huawei, which is still privately held by 50 per cent of its 150,000-strong employee base, has started a programme to give Indian employees stock options in Huawei Telecommunications India Pvt. Ltd. For the first time in Huawei's history, a pilot project called 'Time-based Unit Plan' (TUP) was started in February in India. "Anyone who has worked for more than three years at a decision-making level will be entitled to TUP," says Scott Sykes, Huawei's spokesperson.Shareholders will receive dividends in cash, based on the company's performance every year over a five year cycle. If things go as planned, the TUP scheme will later be taken to other Huawei locations globally. 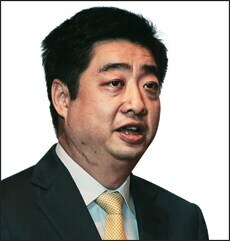 Huawei's future depends upon using technology and software to bring down cost and make networks more efficient. Clearly, development work in India will be the key to Huawei becoming a bigger player.